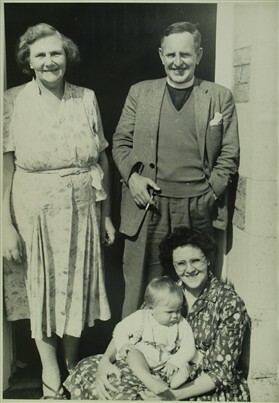 John Cook, the Rector of Orwell in the late 50's and early 60's, his wife Ivy, daughter Dera and grandson Oliver (myself) in the doorway of the rectory. The photo was probably taken in 1961. The Latin name for Ivy is of course Hedera, hence my mother's name. Arthur Howard, the baker, was the church warden and a good friend of the family. John Cook was a strict teetotaller. Arthur one day came to him and asked him to be a reference for his application for an off-license. John was surprised as he knew Arthur was aware of his views of alcohol. When he asked Arthur why he was asking him for a reference Arthur explained that he hadn't wanted to go behind John's back. Arthur got his license. This page was added by Oliver Macdonald on 13/12/2016.